I'm just thrilled with my Christmas present reading, which should keep me going for a while. If you're interested in looking inside the books or buying them yourself feel free to click on the picture to be taken to my first attempt at an interactive Amazon Affiliate Flickr page. Otherwise, feel free to search for them on Amazon. Have you read any of the titles? What did you think? Many of you have recommended them to me in passing or in your conferences this past year so you, too, are to be thanked for filling up my Amazon wishlist with these interesting morsels. Thanks to you all and a Merry Christmas! This is not spam comment. And, nothing to do with your reading spree. You visited my blog and had seen the post on "Blog as a teaching tool." Now, I wish to share something with you. My 2007 resolution is a friendly deal to get more comments at my blog and promptly reciprocate. I've been reading The Tipping Point for nearly four months now - it's been excellent and given me a lot of food for thought about how to get blogging in schools from the realms of the Early Adopters into the mainstream of teachers. Why four months? Because I spend so much time reading online, my dead tree reading has really suffered! I'm lucky to read for 2-3 mins a night before I go to sleep. My new holiday read is Ludwig Wittgenstein: The Duty of Genius, by Ray Monk. My feeling is that the pop business books - the stuff by Gladwell and his ilk - will not teach you that much. Just my view. 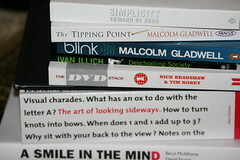 Anything Malcolm Gladwell gets my two thumbs up! Gladwell may be pop but he raises many interesting issues. 'Blink' certainly challenged my thinking on the centrality of metacognition, critical thinking and social construction. I still feel these are vital but now understand more about integrating intuition into my - and my pupils' - schema. And it's good to see someone the age of my children discovering Illich. Reading Gladwell with de Bono should provide both sides of the story. Also looking forward to getting into Illich asap. Hope you have a great New Year, Hilery!